Hawaii's Poet Laureate in 2012, Kealoha has expanded his art to accommodate his vision. His new theater production includes dance, music, and projections by respected local artists. "The Story of Everything" will be filmed live this Friday night, March 22, 2019, at the Hawaii Theatre. When Governor Neil Abercrombie appointed Steven Kealoha Wong as Hawai‘i’s first Poet Laureate, he handed Kealoha a mission for the next year: promote writing, reading, and the appreciation of poetry among Hawai‘i’s people. Seven years later, Kealoha’s crafted a multimedia theatre production that’s a creation story for today. 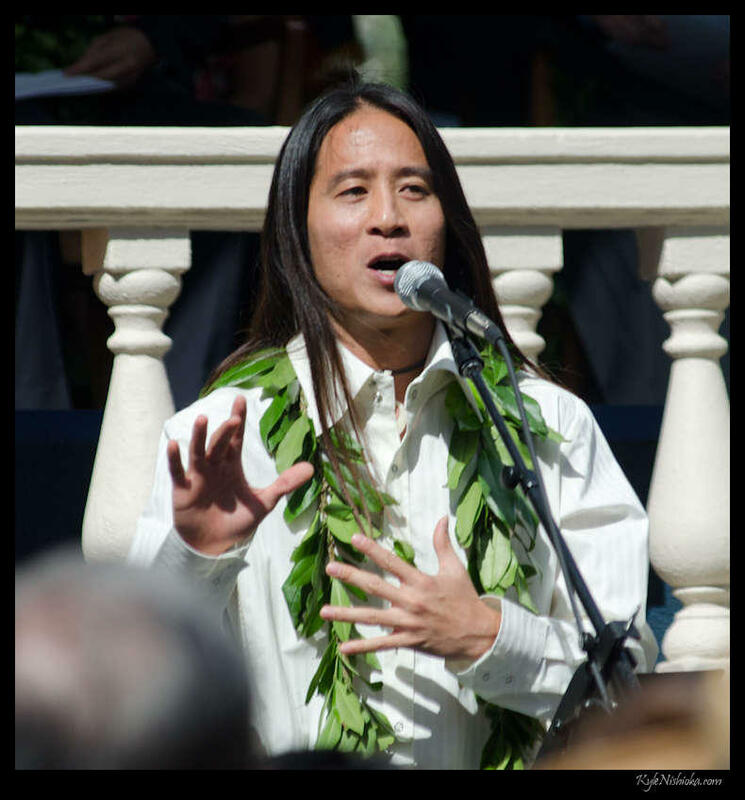 In 2010, Kealoha delivered a forward-looking spoken word poem at Governor Neil Abercrombie's inauguration. Kealoha talks about the inspiration and impetus behind "The Story of Everything." Kealoha’s "The Story of Everything" plays tomorrow night, Friday, in a one-time only filmed live performance at the Hawai‘i Theatre. In 2010, Kealoha enlivened governor Abercrombie’s inauguration with a forward looking spoken word poem. Then, Poet Laureate in 2012, it’s kind of a responsibility, but the project Kealoha embarked on, the History of Everything, began in a very personal space---remember, he majored in nuclear physics. Kealoha: The reason why I wrote this thing, is because I found out I was going to have a child, right, 7 years ago. When I found out, I started to write about what it might be like to be a father. One of the questions that kept popping up was, one day this future child of mine is going to ask me where we come from. At this point, best to remember, Kealoha has a degree in nuclear physics, minor in writing from MIT. Kealoha: For me, I don’t subscribe to some kind of notion =that was created for us through religions and what not, I subsribe to science, so I startd to write scientifically hwere we come from. Kealoha: When I started to write about the Big Bang, it became a war story between matter and anti-matter, and they kept destroying each other. In that war story, matter and anti-matter became heroes and enemies and intentions and conflict. In writing this thing, I realized this story that science tells us can be hyper extended to an actual story. Kealoha figures past creation stories enshrined the highest science of their time. Kealoha: We haven’t had a creation story created for a while, for thousands of years! Everything we know has changed so rapidly, I figured it was time for us to have a new story we could attach our current knowledge base to. 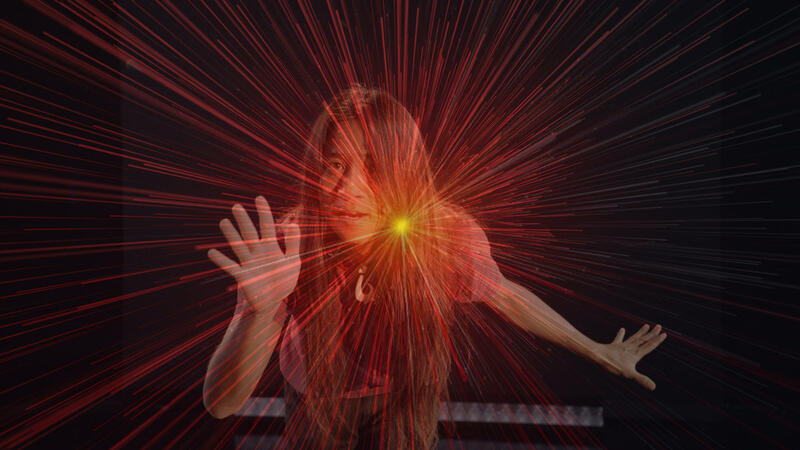 Kealoha has developed his story of 3.7 billion years of evolution into a theatre performance involving dancers, projections, live music, and his signature spoken word elements. Kealoha: To me, the live theatre experience is everything. Because it’s us, as humans, interacting with each other. We spend so much of our days looking at these tiny little devices and screens, but to really connect on a human level, we crave that. We crave that as people. For me, theater changed my life. I just want to give that to future generations. He’s got help. The Story of Everything features ‘ukulele phenom Taimane, world beats from Quadrophonix, chanter Kau’i Kānaka’ole, dancers Jonathan Clarke Sypert, Jamie Nakama, Jory Horne, and visuals by Solomon Enos. Honolulu is having an art moment, with fine international artworks on view around town. For example, the Sunday Times UK called Lisa Reihana’s “Emissaries” the best artwork at the 2017 Venice Biennale. The work, representing New Zealand, left Venice with accolades and bookings in Paris, London, Vienna, and guess what? “Emissaries” is now in Honolulu in a particularly revealing installation. Cities that host biennials soon find a lot of art events piggybacking on the excitement. Last Friday night, a throng of party goers kicked off the Honolulu Biennial for its two month run at Ward Center. Saturday night, another international art show opened in an unexpected space on Nimitz Highway. HPR’s Noe Tanigawa reports, the new iBiennale got off to an auspicious start. The ARTS at Marks Garage is under new management. The mission is still: To transform downtown Honolulu with the power of the arts. It was a nice mix of creative brains and skillful hands the other night at the opening of SymbioSEAS—an art-sci (art and science) collaboration.